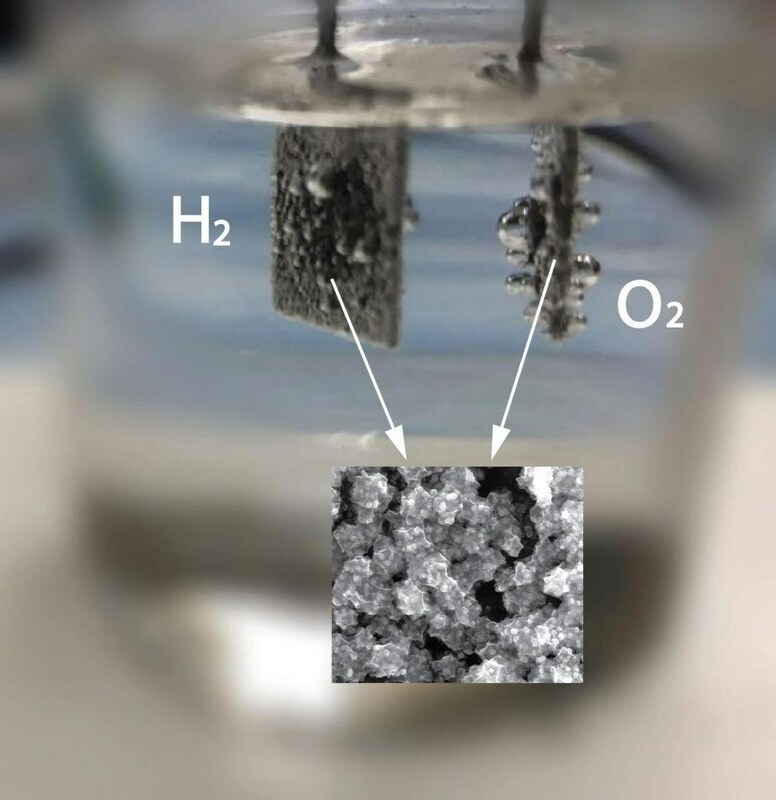 Washington State University researchers have found a way to more efficiently create hydrogen from water – an important key in making renewable energy production and storage viable. The researchers, led by professors Yuehe Lin and Scott Beckman in the School of Mechanical and Materials Engineering, have developed a catalyst from low cost materials. It performs as well as or better than catalysts made from precious metals that are used for the process. The work is published in the journal Advanced Energy Materials (http://onlinelibrary.wiley.com/doi/10.1002/aenm.201601555/full). Energy conversion is a key to the clean energy economy. Because solar and wind sources produce power only intermittently, there is a critical need for ways to store and save the electricity they create. One of the most promising ideas for storing renewable energy is to use the excess electricity generated from renewables to split water into oxygen and hydrogen; the hydrogen can then be fed into fuel-cell vehicles. “Hydrogen production by electrolysis of water is the greenest way to convert electricity to chemical fuel,” said Junhua Song, a WSU Ph.D. student who synthesized the catalyst and performed most of the experimental work. Industries have not widely used the water splitting process, however, because of the prohibitive cost of the precious metal catalysts that are required – usually platinum or ruthenium. Many of the methods to split water also require too much energy, or the required materials break down too quickly. Instead, industries generally use a fossil-fuel based process to produce hydrogen for fuel cells, which generates harmful greenhouse gas emissions. For their catalyst, the WSU research team added nanoparticles of relatively inexpensive copper to a cobalt-based framework. The new catalyst was able to conduct electricity better than the commonly used precious metal catalysts. It produced oxygen better than existing commercial catalysts and produced hydrogen at a comparable rate. The researchers used both theoretical modeling and experimental assessments to demonstrate and fine tune their catalyst’s effectiveness. “The modeling helped the researchers gain understanding at the atomic level of how the copper atoms improve the catalyst, which helped in precisely choosing and tuning the elements to enhance performance,” said Beckman. The researchers are looking for external funding to scale up their work. They hope to improve the catalyst’s stability and efficiency. The work is in keeping with WSU’s Grand Challenges, a suite of research initiatives aimed at large societal issues. It is particularly relevant to the challenge of sustainable resources and its theme of meeting energy needs while protecting the environment.